Libya (Arabic: ليبيا) is a country in northern Africa that was taken over, at the encouragement of President Obama, by militant Muslims in 2011. The revolutionaries murdered Muammar al-Gaddafi, who had ruled the nation since 1969. Geographically, Libya borders the Mediterranean Sea to the north, Egypt to the east, Sudan to the southeast, Chad and Niger to the south, Algeria to the west, and Tunisia to the northwest. In September 2012, the Obama Administration ignored security warnings and refused to protect the American embassy there, resulting in the Benghazi Attack and the murder of the American ambassador John Christopher Stevens and three other Americans. 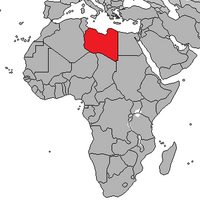 Libya has a small population in a large land area. Population density is about 50 persons per km2. (80/sq. mi.) in the two northern regions of Tripolitania and Cyrenaica, but falls to less than one person per km2. (1.6/sq. mi.) elsewhere. Ninety percent of the people live in less than 10% of the area, primarily along the coast. More than half the population is urban, mostly concentrated in the two largest cities, Tripoli and Benghazi. Thirty-three percent of the population is estimated to be under age 15. Native Libyans are primarily a mixture of Arabs and Berbers. Small Tebou and Touareg tribal groups in southern Libya are nomadic or semi-nomadic. Among foreign residents, the largest groups are citizens of other African nations, including North Africans (primarily Egyptians and Tunisians), West Africans and Sub-Saharan Africans. Population (July 2007 est. ): 6,036,914 (includes non-nationals, of which an estimated 500,000 or more are sub-Saharan Africans living in Libya). Annual growth rate (2007 est. ): 2.262%. Birth rate (2007 est.) --26.09 births/1,000 population. Death rate (2007 est.) --3.47 deaths/1,000 population. Education: Years compulsory—9. Attendance—90%. Literacy (age 15 and over who can read and write)--total population 82.6%; female 72% (2003 est.). Health (2007 est. ): Infant mortality rate—22.82 deaths/1,000 live births. Life expectancy—total population 76.88 yrs. ; male 74.1 yrs. ; female 78.58 yrs. Work force (2006 est. ): 1.787 million, an estimated 500,000 of whom are sub-Saharan African foreign workers. Total area: 1,759,540 km2, slightly larger than Alaska. Coastline: 1,770 km. Climate: Mediterranean along coast; dry, extreme desert interior. Terrain: mostly barren, flat to undulating plains, plateaus, depressions. Environment - current issues: desertification; limited natural freshwater resources; the Great Manmade River Project, the largest water development scheme in the world, brings water from large aquifers under the Sahara to coastal cities. Environment - international agreements: party to: Biodiversity, Climate Change, Climate Change-Kyoto Protocol, Desertification, Endangered Species, Hazardous Wastes, Marine Dumping, Ozone Layer Protection, Ship Pollution, Wetlands. Source: CIA The World Factbook. City beach near the Central Business District of Tripoli, 2006. Tripoli, Central Business District, 2009. Prior to the 2011 revolution, Libya's political system was in theory based on the political philosophy in Gaddafi's Green Book, which combined socialist and Islamic theories and rejected parliamentary democracy and political parties. In reality, Gaddafi exercised near total control over major government decisions. For the first seven years following the revolution, Colonel Gaddafi and 12 fellow army officers, the Revolutionary Command Council, began a complete overhaul of Libya's political system, society and economy. In 1973, he announced the start of a "cultural revolution" in schools, businesses, industries, and public institutions to oversee administration of those organizations in the public interest. On March 2, 1977, Gaddafi convened a General People's Congress (GPC) to proclaim the establishment of "people's power," change the country's name to the Socialist People's Libyan Arab Jamahiriya, and to vest, theoretically, primary authority in the GPC. The GPC, built on the socilaist model, was the legislative forum that interacted with the General People's Committee, whose members were secretaries of Libyan ministries. It served as the intermediary between the masses and the leadership and was composed of the secretariats of some 600 local "basic popular congresses." The GPC secretariat and the cabinet secretaries were appointed by the GPC secretary general and confirmed by the annual GPC congress. These cabinet secretaries were responsible for the routine operation of their ministries, but Gaddafi exercised real authority directly or through manipulation of the peoples and revolutionary committees. Gaddafi remained the de facto chief of state and secretary general of the GPC until 1980, when he gave up the office. Although he held no formal office, Gaddafi exercised power with the assistance of a small group of trusted advisers, who included relatives from his home base in the Sirte region, which lies between the traditional commercial and political power centers in Benghazi and Tripoli. In the 1980s, competition grew between the official Libyan Government and military hierarchies and the revolutionary committees. An abortive coup attempt in May 1984, apparently mounted by Libyan exiles with internal support, led to a short-lived reign of terror in which thousands were imprisoned and interrogated. An unknown number were executed. Gaddafi used the revolutionary committees to search out alleged internal opponents following the coup attempt, thereby accelerating the rise of more radical elements inside the Libyan power hierarchy. In 1988, faced with rising public dissatisfaction with shortages in consumer goods and setbacks in Libya's war with Chad, Gaddafi began to curb the power of the revolutionary committees and to institute some domestic reforms. The regime released many political prisoners and eased restrictions on foreign travel by Libyans. Private businesses were again permitted to operate. In the late 1980s, Gaddafi began to pursue an anti-Islamic fundamentalist policy domestically, viewing Islamist fundamentalism as a potential threat to the regime. Gaddafi's security forces launched a preemptive strike at alleged coup plotters in the military and among the Warfallah tribe in October 1993. Widespread arrests and government reshufflings followed, accompanied by public "confessions" from fundamental Islamist opponents and allegations of torture and executions. The military, once Gaddafi's strongest supporters, became a potential threat in the 1990s. In 1993, following a failed coup attempt that implicated senior officers, Gaddafi began purges of Islamists from the military periodically, eliminating potential rivals and inserting his own loyal followers in their place. The Libyan court system under Gaddafi and prior to the institution of Sharia law in 2012 consisted of three levels: the courts of first instance; the courts of appeals; and the Supreme Court, which is the final appellate level. The GPC appointed justices to the Supreme Court. Special "revolutionary courts" and military courts operated outside the court system to try political offenses and crimes against the Gaddafi regime. "People's courts," another example of extrajudicial authority, were abolished in January 2005. Libya's justice system at that time was nominally based on Sharia law. 2013 the Libyan Congress voted for Introducing Sharia law. After 1969, Gaddafi determined Libya's foreign policy. His principal foreign policy goals were Arab unity, elimination of Israel, advancement of a secularized brand of Islam, support for Palestinians, elimination of outside—particularly Western—influence in the Middle East and Africa, and support for a range of "revolutionary" causes. After the 1969 coup, Gaddafi closed American and British bases on Libyan territory and partially nationalized all foreign oil and commercial interests in Libya. He also played a key role in promoting the use of oil embargoes as a political weapon for challenging the West, hoping that an oil price rise and embargo in 1973 would persuade the West—especially the United States—to end support for Israel. Gaddafi rejected both Soviet communism and Western capitalism, and claimed he was charting a middle course. Libya's relationship with the former Soviet Union involved massive Libyan arms purchases from the Soviet bloc and the presence of thousands of east bloc advisers. Libya's use—and heavy loss—of Soviet-supplied weaponry in its war with Chad was a notable breach of an apparent Soviet-Libyan understanding not to use the weapons for activities inconsistent with Soviet objectives. As a result, Soviet-Libyan relations reached a nadir in mid-1987. After the fall of the Warsaw Pact and the Soviet Union, Libya concentrated on expanding diplomatic ties with Third World countries and increasing its commercial links with Europe and East Asia. Following the imposition of UN sanctions in 1992, these ties significantly diminished. Following a 1998 Arab League meeting in which fellow Arab states decided not to challenge UN sanctions, Gaddafi announced that he was turning his back on pan-Arab ideas, which had been one of the fundamental tenets of his philosophy. Instead, Libya pursued closer bilateral ties, particularly with North African neighbors Egypt, Tunisia, and Morocco. It has also sought to develop its relations with Sub-Saharan Africa, leading to Libyan involvement in several internal African disputes in the Democratic Republic of Congo, Sudan, Somalia, Central African Republic, Eritrea and Ethiopia. Libya has also sought to expand its influence in Africa through financial assistance, ranging from aid donations to impoverished neighbors such as Niger to oil subsidies to Zimbabwe, and through participation in the African Union. Gaddafi has proposed a borderless "United States of Africa" to transform the continent into a single nation-state ruled by a single government. This plan has been greeted with skepticism. Libya has played a helpful role in facilitating the provision of humanitarian assistance to Darfur refugees in Chad. One of the longest-standing issues in Libya's relationship with the European Union and the international community was resolved in July 2007 with the release of five Bulgarian nurses and a Palestinian doctor who had been convicted in 1999 of deliberately infecting over 400 children in a Benghazi hospital with the HIV virus. The six medics were sentenced to death in 2004, a sentence that was upheld by the Libyan Supreme Court but commuted in July 2007 by the Higher Judicial Council to life in prison. Under a previous agreement with the Bulgarian Government on the repatriation of prisoners, the medics were allowed to return to Bulgaria to finish their sentence, where upon arrival the Bulgarian president pardoned all six. The Benghazi International Fund, established by the United States and its European allies, raised $460 million to distribute to the families of the children infected with HIV, each of whom received $1 million. After Gaddafi's 1969 coup, U.S.-Libyan relations became increasingly strained because of Libya's foreign policies supporting international terrorism and subversion against moderate Arab and African governments. In 1972, the United States withdrew its ambassador. Export controls on military equipment and civil aircraft were imposed during the 1970s, and U.S. embassy staff members were withdrawn from Tripoli after a mob attacked and set fire to the embassy in December 1979. The U.S. Government designated Libya a "state sponsor of terrorism" on December 29, 1979. In May 1981, the U.S. Government closed the Libyan "people's bureau" (embassy) in Washington, DC, and expelled the Libyan staff in response to a general pattern of conduct by the people's bureau contrary to internationally accepted standards of diplomatic behavior. Due to Libya's continued support for terrorism at that time, the United States adopted additional economic sanctions against Libya in January 1986, including a total ban on direct import and export trade, commercial contracts, and travel-related activities. In addition, Libyan Government assets in the United States were frozen. When evidence of Libyan complicity was discovered in the Berlin discothèque terrorist bombing that killed two American servicemen, the United States responded by launching an aerial bombing attack against targets near Tripoli and Benghazi in April 1986 (Operation El Dorado Canyon). Subsequently, the United States maintained its trade and travel embargoes and brought diplomatic and economic pressure to bear against Libya. This pressure helped to bring about the Lockerbie settlement and Libya's renunciation of WMD and MTCR-class missiles. In 1991, two Libyan intelligence agents were indicted by federal prosecutors in the U.S. and Scotland for their involvement in the December 1988 bombing of Pan Am flight 103. In January 1992, the UN Security Council approved Resolution 731 demanding that Libya surrender the suspects, cooperate with the Pan Am 103 and UTA 772 investigations, pay compensation to the victims' families, and cease all support for terrorism. Libya's refusal to comply led to the approval of UNSC Resolution 748 on March 31, 1992, imposing sanctions designed to bring about Libyan compliance. Continued Libyan defiance led to passage of UNSC Resolution 883—a limited assets freeze and an embargo on selected oil equipment—in November 1993. UN sanctions were lifted on September 12, 2003, after Libya fulfilled all remaining UNSCR requirements, including renunciation of terrorism, acceptance of responsibility for the actions of its officials, and payment of appropriate compensation to the victims' families. On December 19, 2003, Libya announced its intention to rid itself of WMD and MTCR-class missile programs. Gaddafi pledged to cooperate with the U.S., the U.K., the International Atomic Energy Agency, and the Organization for the Prohibition of Chemical Weapons toward those objectives. Libya under Gaddafi also signed the IAEA Additional Protocol and then became a State Party to the Chemical Weapons Convention. In recognition of these actions, the U.S. began the process of normalizing relations with Libya under Gaddafi. The U.S. terminated the applicability of the Iran-Libya Sanctions Act to Libya and the President signed an Executive Order on September 20, 2004 terminating the national emergency with respect to Libya and ending IEEPA-based economic sanctions. This action had the effect of unblocking assets blocked under the Executive Order sanctions. Restrictions on cargo aviation and third-party code-sharing have been lifted, as have restrictions on passenger aviation. Certain export controls remain in place. U.S. diplomatic personnel reopened the U.S. Interest Section in Tripoli on February 8, 2004. The mission was upgraded to a U.S. Liaison Office on June 28, 2004, and to a full embassy on May 31, 2006. The establishment in 2005 of an American School in Tripoli demonstrates the increased presence of Americans in Libya, and the continuing normalization of bilateral relations. Libya re-established its diplomatic presence in Washington with the opening of an Interest Section on July 8, 2004, which was subsequently upgraded to a Liaison Office in December 2004 and to a full embassy on May 31, 2006. On May 15, 2006, the State Department announced its intention to rescind Libya's designation as a state sponsor of terrorism in recognition of the fact that Libya had met the statutory requirements for such a move: it had not provided any support for acts of international terrorism in the preceding six-month period, and had provided assurances that it would not do so in the future. On June 30, 2006, the U.S. rescinded Libya's designation as a state sponsor of terrorism. In July 2007, Mr. Gene Cretz was nominated by President Bush as ambassador to Libya. A 2010 photo of Gaddafi and Obama at the G8 Summit in Italy. This was the first time in Gaddafi's 40-year rule that he met with a sitting U.S. president. This set off a fierce debate in the Obama administration over the wisdom of arming terrorists. It is now known sometime prior to March 31, 2011, at the urging of Secretary of State Hillary Rodham Clinton and over the objections of his National Security Council, Obama signed a Presidential Finding authorizing support for the rebel jihadis. Hillary Clinton was the chief proponent and the architect of the war against Libya. It is clear that she pursued this war as a staging effort for her Presidential bid. It wasn't even a war for an ideological purpose. This war ended up producing the refugee crisis in Europe, changing the political colour of Europe, killing more than 40,000 people within a year in Libya, while the arms from Libya went to Mali and other places, boosting or causing civil wars, including the Syrian catastrophe. By October 2011, Libyan rebel fighting groups with support from the U.S. and NATO, overtook the capital of Tripoli and toppled the government. Gaddafi was captured and brutally and sadistically murdered. The jihadis were immediately recognized by the Obama administration and the U.N. as the legitimate government. Mustafa Abdul-Jalil, chairman of the National Transitional Council, announced that Sharia will be the source for all legislation in Libya and that all laws conflicting with Sharia are null and void. Abdel Rahim al-Kib, the country's interim prime minister, echoed Jalil's words a couple of days later. Around the same time these statements were made an Al Qaeda flag was flown above the Benghazi courthouse, and reports were surfacing that the Libyan jihadis imposed Sharia law in some parts of the country even earlier. A church bombing by the end of 2012 left two dead, and in February 2013 four foreign nationals were arrested for distributing Bible pamphlets. They may face the death penalty. The world's largest irrigation project is the largest water construction scheme ever undertaken; it extends 4000km into the Sahara desert and transports 6,500,000 m cubed of fresh water every day, providing an almost unlimited supply to the Libyan population, for municipal, industrial and agricultural use. The government dominates Libya's socialist-oriented economy through complete control of the country's oil resources, which account for approximately 97% of export earnings, 75% of government receipts, and 54% of the gross domestic product. Oil revenues constitute the principal source of foreign exchange. Much of the country's income has been lost to waste, corruption, conventional armaments purchases, and attempts to develop weapons of mass destruction, as well as to large donations made to developing countries in attempts to increase Gaddafi's influence in Africa and elsewhere. Although oil revenues and a small population give Libya one of the highest per capita GDPs in Africa, the government's mismanagement of the economy has led to high inflation and increased import prices. These factors resulted in a decline in the standard of living from the late 1990s through 2003. Real GDP ($2000, 2006): $46.451 billion. GDP per capita (PPP, 2006): $12,204. Real GDP growth rate (2006): 5.6%. Agriculture: Products—wheat, barley, olives, dates, citrus, vegetables, peanuts, soybeans; cattle; approximately 75% of Libya's food is imported. Industry: Types—petroleum, food processing, textiles, handicrafts, cement. Trade: Exports (2006 est.) --$37.02 billion f.o.b. : crude oil, refined petroleum products. Major markets (2005)--Italy (38%), Germany (15.1%), Spain (9.3%), Turkey (6.2%), France (6.2%), U.S. (5.2%). Imports (2006 est.) --$14.47 billion f.o.b. : machinery, transport equipment, food, manufactured goods. Major suppliers (2003)--Italy (21.2%), Germany (10.2%), Tunisia (5.9%), Turkey (4.8%), U.K. (4.8%), France (4.7%), South Korea (4.6%), China (4.5%). Old covered market in Benghazi. Despite efforts to diversify the economy and encourage private sector participation, extensive controls of prices, credit, trade, and foreign exchange constrain growth. Import restrictions and inefficient resource allocations have caused periodic shortages of basic goods and foodstuffs. Although agriculture is the second-largest sector in the economy, Libya imports most foods. Climatic conditions and poor soils severely limit output, while higher incomes and a growing population have caused food consumption to rise. Domestic food production meets about 25% of demand. On September 20, 2004, President Bush signed an Executive Order ending economic sanctions imposed under the authority of the International Emergency Economic Powers Act (IEEPA). U.S. persons are no longer prohibited from working in Libya, and many American companies are actively seeking investment opportunities in Libya. The government has announced ambitious plans to increase foreign investment in the oil and gas sectors to significantly boost production capacity. The government is also pursuing a number of infrastructure projects such as highways, railways, telecommunications backbones, and irrigation. Roman circus at Leptis Magna. The Arabs conquered Libya in the seventh century A.D. In the following centuries, most of the indigenous peoples adopted Islam and the Arabic language and culture. The Ottoman Turks conquered the country in the mid-16th century. Libya remained part of their empire—although at times virtually autonomous—until Italy invaded in 1911 and, in the face of years of resistance, made Libya a colony. In 1934, Italy adopted the name "Libya" (used by the Greeks for all of North Africa, except Egypt) as the official name of the colony, which consisted of the Provinces of Cyrenaica, Tripolitania, and Fezzan. King Idris I, Emir of Cyrenaica, led Libyan resistance to Italian occupation between the two World Wars. From 1943 to 1951, Tripolitania and Cyrenaica were under British administration, while the French controlled Fezzan. In 1944, Idris returned from exile in Cairo but declined to resume permanent residence in Cyrenaica until the removal in 1947 of some aspects of foreign control. Under the terms of the 1947 peace treaty with the Allies, Italy relinquished all claims to Libya. On November 21, 1949, the UN General Assembly passed a resolution stating that Libya should become independent before January 1, 1952. King Idris I represented Libya in the subsequent UN negotiations. When Libya declared its independence on December 24, 1951, it was the first country to achieve independence through the United Nations and one of the first former European possessions in Africa to gain independence. The United States supported the UN resolution and raised the status of its office at Tripoli from a consulate general to a legation. Libya opened a legation in Washington, DC, in 1954. Both countries subsequently raised their missions to embassy level. Libya was proclaimed a constitutional and a hereditary monarchy under King Idris. On September 1, 1969, a small group of military officers led by then 28-year-old army officer Mu'ammar Abu Minyar al-Gaddafi staged a coup d'état against King Idris, who was exiled to Egypt. The new regime, headed by the Revolutionary Command Council (RCC), abolished the monarchy and proclaimed the new Libyan Arab Republic. Gaddafi emerged as leader of the RCC and eventually as de facto chief of state, a political role he still plays. The Libyan government asserts that Gaddafi currently holds no official position, although he is referred to in government statements and the official press as the "Brother Leader and Guide of the Revolution." The new RCC's motto became "freedom, socialism, and unity." It pledged itself to remedy "backwardness", take an active role in the Palestinian Arab cause, promote Arab unity, and encourage domestic policies based on social justice, non-exploitation, and an equitable distribution of wealth. Gaddafi founded the World Islamic Call Society, an umbrella organization with a global reach largely funded by Gaddafi to educate people about Islamic thought and culture. The organization has working relationships with UNICEF, UNESCO and the Roman Catholic Church. An early objective of the new government was withdrawal of all foreign military installations from Libya. Following negotiations, British military installations at Tobruk and nearby El Adem were closed in March 1970, and U.S. facilities at Wheelus Air Force Base near Tripoli were closed in June 1970. That July, the Libyan Government ordered the expulsion of several thousand Italian residents. By 1971, libraries and cultural centers operated by foreign governments were ordered closed. In the 1970s, Libya claimed leadership of Arab and African revolutionary forces and sought active roles in international organizations. Late in the 1970s, Libyan embassies were redesignated as "people's bureaus," as Gaddafi sought to portray Libyan foreign policy as an expression of the popular will. The people's bureaus, aided by Libyan religious, political, educational, and business institutions overseas, exported Gaddafi's revolutionary philosophy abroad. Benghazi, where violent protests against the Gaddafi regime were instigated in February 2011. Gaddafi's confrontational foreign policies and use of terrorism, as well as Libya's growing friendship with the U.S.S.R., led to increased tensions with the West in the 1980s. Following a terrorist bombing at a discothèque in West Berlin frequented by American military personnel, in 1986 the U.S. retaliated militarily against targets in Libya, and imposed broad unilateral economic sanctions. After Libya was implicated in the 1988 bombing of Pan Am flight 103 over Lockerbie, Scotland, UN sanctions were imposed in 1992. UN Security Council resolutions (UNSCRs) passed in 1992 and 1993 obliged Libya to fulfill requirements related to the Pan Am 103 bombing before sanctions could be lifted. Gaddafi initially refused to comply with these requirements, leading to Libya's political and economic isolation for most of the 1990s. Gaddafi's Islamic Call Society focus shifted to "build foundations of cooperation and dialogue among cultures and religions" and not just Islamic proselytizing. In 1999, Libya fulfilled one of the UNSCR requirements by surrendering two Libyans suspected in connection with the bombing for trial before a Scottish court in the Netherlands. One of these suspects, Abdel Basset al-Megrahi, was found guilty; the other was acquitted. Al-Megrahi's conviction was upheld on appeal in 2002. In August 2003, Libya fulfilled the remaining UNSCR requirements, including acceptance of responsibility for the actions of its officials and payment of appropriate compensation to the victims' families. UN sanctions were lifted on September 12, 2003. U.S. International Emergency Economic Powers Act (IEEPA)-based sanctions were lifted September 20, 2004. Gaddafi's Islamic Call Society gave the Anglican Church of Christ the King in Tripoli a church building on the downtown square to compensate for the one lost at the time of the 1969 Revolution. The government paid for all the renovations and repairs, and provided housing for the vicar. On December 19, 2003, Libya publicly announced its intention to rid itself of weapons of mass destruction (WMD) and Missile Technology Control Regime (MTCR)-class missile programs. Gaddafi cooperated with the U.S., the U.K., the International Atomic Energy Agency, and the Organization for the Prohibition of Chemical Weapons toward these objectives. Libya has also signed the IAEA Additional Protocol and has become a State Party to the Chemical Weapons Convention. These were important steps toward full diplomatic relations between the U.S. and Libya. Since the death of Gaddafi, Libya sinks into chaos. Different militias such as the Libyan offshoot of the Islamic State, but also Gaddafi-supporter are fighting each other and are operating against the government. ↑ Attack on Libyan church building kills two, Reuthers, Dec 30, 2012. ↑ Libya arrests foreign 'missionaries' Four foreign nationals accused of distributing Christian literature, a charge that could carry the death penalty, Chris Stephen guardian.co.uk, Sunday 17 February 2013. ↑ Vatican: Annual Muslim-Catholic dialogue conference underway. 2003. ↑ The Libyan government supports the Anglican church in Tripoli, Munir Hanna Anis Armanius, Religious News Service from the Arab World, May 16, 2001. America's secret plan to arm Libya's rebels. The Independent, UK. Why Libya's Uprising Is Bad for the World Economy. Libyan schoolchildren on message for visiting media. Libya War - U.S Invading Libya For Oil Says, Louis Farrakhan. From Tripoli to Damascus:Arab wild geese take wing. This page was last modified on 9 April 2019, at 11:43.